I’m currently about halfway through Straight Man, also by Richard Russo. I knew I wanted to do a recommendation for Empire Falls, but I’m not sure yet if I’ll be doing one for Straight Man. I was tempted to just do an Author Spotlight so I could talk about both, but as of right now I’ve only read 1.5 books by Russo. So here we are. I read this book over the summer, when I was doing a lot of thinking about writing, particularly novel writing and play writing. What I like about play writing is that in many ways it’s the same as novel writing, just super stripped-down. You’re telling the five-part story (introduction, rising action, climax, falling action, resolution) with dialogue alone. This is really no different than what’s going on in most novels- there’s just other stuff like character development, setting, etc, etc, that makes it a little more occluded. 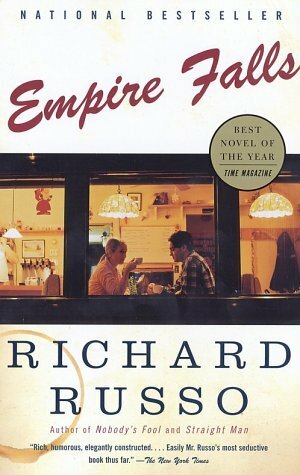 Empire Falls is a novel in which the five parts are clearly on display. Miles Roby’s main problem is made very clear from page one: he’s standing still. We spend the first sections of the book (introduction and rising action) learning how very stuck he is, so much so that we’re aggravated by his situation, wishing he was a real person so we could slap him in the face. Predictably, the climax provides the impetus for Miles to come un-stuck. For all that the plot line is easy to follow, the structure well laid-out, this isn’t a boring or simplistic novel. It won the Pultizer after all. But more than that, it’s a story of humor and heart. His characters are larger-than-life, popping out against the dull background of a backwater, dried-up little town. The viewpoint shifts between Miles, his father, Max, his ex-wife, Janine, and his daughter, Tick. Every character has a unique voice, allowing them to jump off the page. I particularly enjoyed the characters of Max and to a lesser degree, Janine, because they are both so completely ridiculous. But they’re not presented as caricatures or stereotypes- they are individuals that happen to continually make less than desirable choices. The pacing is sedate. But it matches Empire Falls. This is a slow, sleepy town where most people live and die without getting out, forever stuck. Once we reach our climax, however, things change with ferocious speed, unsettling the lives of everyone in Empire Falls. Russo demonstrates an extraordinary ability to manipulate the pace, subtly underlining the more complex plot. This was my first Russo novel and as I’m currently reading Straight Man, it won’t be my last.